The Arduino is arguably one of the most copied bits of open source hardware ever. Some of those copies are straight rip offs, but there are plenty of clones out there that take the design and improve or change it in some way. I've rounded up six, open source and commercially available, Arduino compatible devices to find out how they stack up to each other and the Arduino Uno. Each of the clones is an open source, through-hole, user assembled kit, that uses the Atmel ATMega328 and meets the definition of an Arduino. 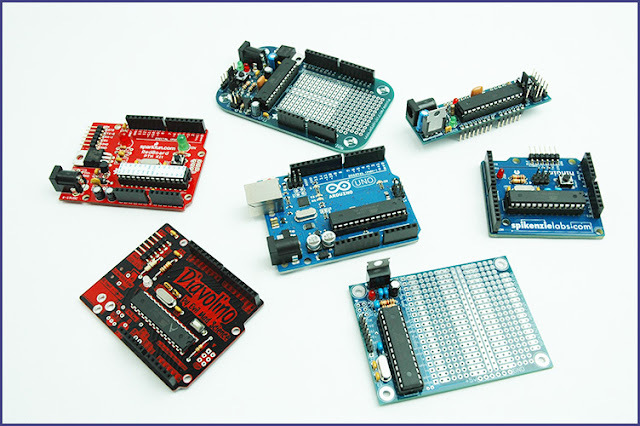 At heart they’re all Arduinos, but they come in a variety of forms and functions. After assembling all six boards myself, I loaded and ran simple sketches on all of them to verify basic functionality. All of the boards performed as expected. 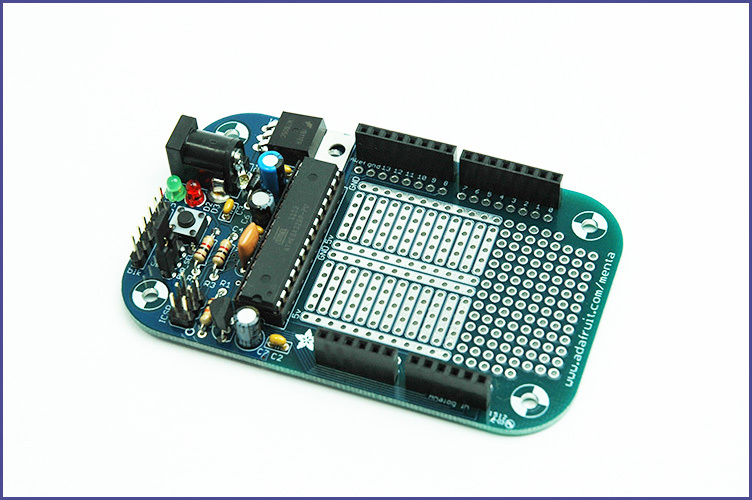 Like all the boards in the shootout, the Arduino Uno is based on the Atmel ATmega328 AVR. Much like previous Arduino boards, the Uno has been the brains of many projects. I have no idea how many of these things are sold each year but I’d bet there’s a ton of them out there and for good reason. I have 4 or 5 Uno’s myself and they all work as advertised. The Uno’s biggest limitation is usually me. 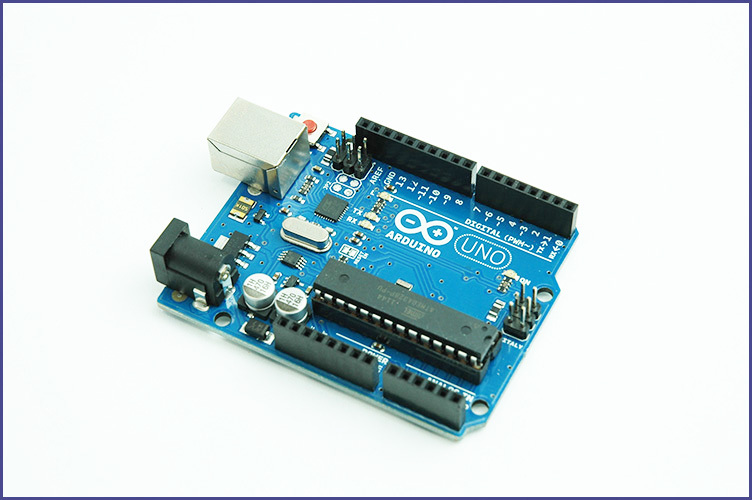 The excellent quality makes the Arduino Uno the baseline by which all Arduino compatibles can be judged. The DC Boarduino is designed to plug into a solderless breadboard. It's basically an Arduino breakout board. This can be handy for quickly prototyping circuits on a breadboard without building out an Arduino each time or having to dedicate a more expensive Arduino board for prototyping. 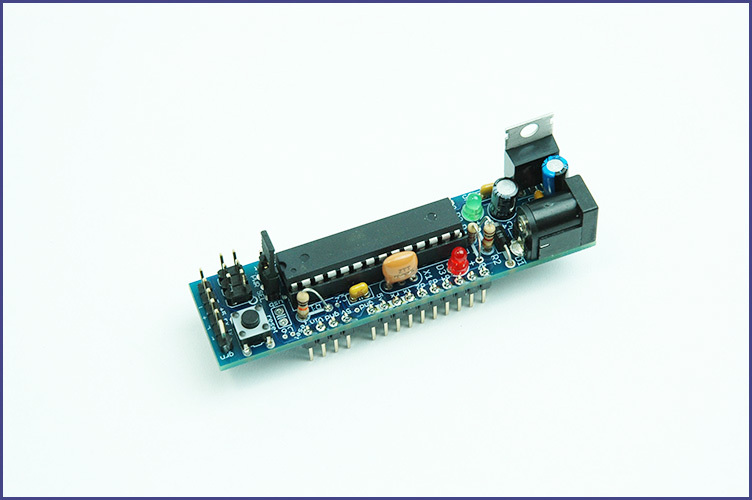 The kit includes a 5V regulator, 2.1mm barrel jack, and both ICSP and FTDI interfaces. The easy to follow and excellent instructions make this kit a fun and easy build. It's been said that, “the devil’s in the details.” It’s the details that make the Diavolino one of the least expensive Arduino clones available and the excellent instructions help to make it a quick and easy build. The Diavolino board is dimensionally the same size as the Arduino Uno and it's shield compatible. Part of the lower cost is accomplished by doing away with some of the “optional” parts. Many clones reduce cost by lowering the component count, but the Diavolino keeps a few of those features on the board that can be populated as needed. The USB controller and the 28 pin socket are gone, but the board has foot prints for a 2.1mm barrel jack, a 5V regulator circuit, and links that change how the board is powered. The female headers are also optional reducing the cost a bit more if they're not needed. The ability to build either a very minimalist clone or a more feature rich device not only keeps the cost of the Diavolino low but make it one of the most versatile boards in this shootout. The Adafruit Menta is the newest design in the shootout. It’s also the most expensive. The kit has a lot of features including 5V and 3.3V regulators, ICSP and FTDI interfaces, and a mint tin. The Menta circuit board layout includes a prototyping area composed of a 12 x 10 pin breadboard like design and over a 100 stand-alone pads. That isn't as big as the Prototino (see below) but the Menta maintains shield compatibility. The Menta is designed to fit in a mint tin and it's a tight fit. It can be tricky to get the board back out past the tin’s rolled edge. An Arduino designed specifically to fit in a mint tin is novel, but the Menta is not limited to mint tins alone. The board has mounting holes at the corners and can be adapted to many other enclosures. The kit assembly was easy, thanks to Adafruit's excellent instructions, but it took a bit of time with the relatively high component count. The Menta might not the best choice for an inexpensive Arduino clone, but it's an excellent kit that is well designed and suitable to many applications. 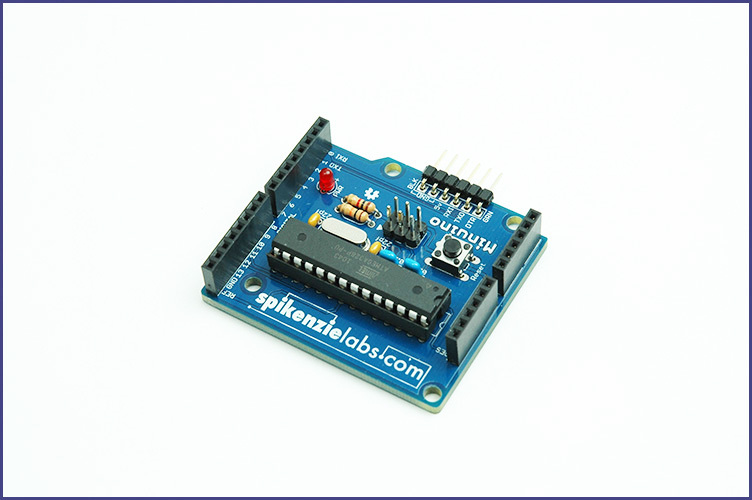 The Spikenzielabs Minuino is one of my favorite Arduino clones if for no other reason than it just looks cool. The thick (.093”) PCB and compact design, that maintains compatibility with the plethora of Arduino shields, makes it unique in my experience. Assembling the Minuino was easy, but I couldn't locate assembly instructions for the kit. Once I gave up trying to find instructions, the kit went together quickly by using the part locations labeled on the circuit board. Spikenzie Labs’ second kit in the shootout, and the second of two boards with breadboard like prototype areas, is the Prototino. It has a large 20 by 6 pin prototype area. By contrast, a half size breadboard is 30 by 10 pins. With the wall to wall prototype area there’s no room for female headers and shield compatibility. The board fits in an mint tin with a little room to spare at each end, but the square corners make for a less than ideal fit. The kit’s low component count and good instructions make assembly quick and easy. For whatever reason Spikenzie labs does not include male header pins for the FTDI interface. The Prototino kit includes an onboard 5V regulator that adds an additional option for powering the board. The giant prototyping area makes the Prototino a good choice for taking a breadboard based circuit to a more permanent and reliable platform. The Sparkfun Redboard PTH (Pin Through Hole) kit is one of the highest priced kits in this shootout. It’s the only kit that came in a box and included a nicely printed instruction book. The Redboard PTH is the same size and shape of the Arduino Uno and includes just about everything but the USB controller. Like every other kit in the shootout, loading sketches must be done through an FTDI interface. The Redboard PTH is a great kit but adds no other advantage over the Arduino Uno. It offers less functionality at the same price. I love it when the underdog consumer comes from behind and snatches victory from the jaws of defeat. It feels like the consumer wins so rarely that it’s difficult not to get a little bit excited about it. All these boards are great kits. They’re all fun to build, work great, and have practical value. It’s hard to choose one over the other when they're all excellent products and some of them differ so widely in features and application. Declaring the consumer the winner isn't just a cop-out. Having a broad array of products to choose from allows the consumer to better match the right board to their application. That's a very good thing. The consumers didn't win this on their own. 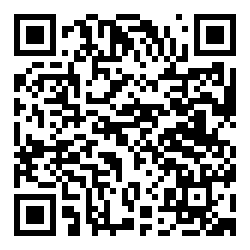 The one thing that makes this all possible, the MVP so to speak, is open source hardware. All companies big and small take a risk when they produce a product. If it turns out to be popular, someone is going to copy it. In many cases, small companies and startups don’t have the resources to protect their intellectual property. The easy route is to just give it away. The risk is mitigated by just the possibility that the product might be improved by the community, might spark innovation, or help someone learn the skills required to make stuff in the same field. The “good will” of open source can go a long way with customers and benefits the community at large. I can’t help but mention the Diavolino again. 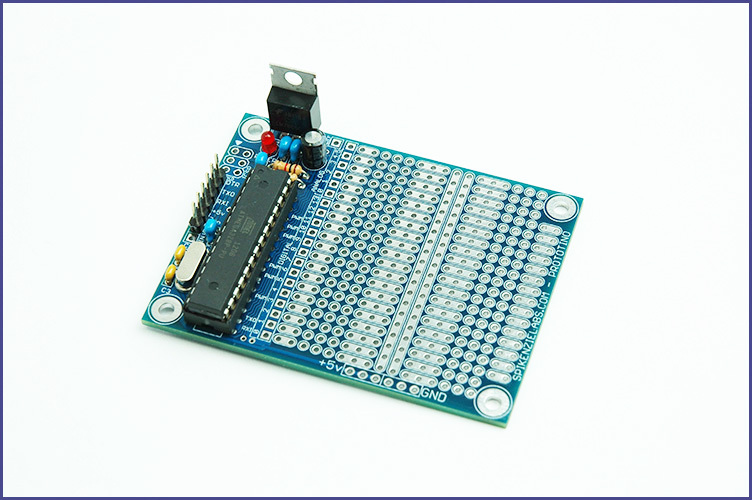 It’s one of the most inexpensive ways to get an Arduino compatible microcontroller board. Not only is the Diavolino inexpensive, it's a great value for the money.